One Source Equipment Rentals has gas, propane, and diesel powered welders for rent or sale from Miller Electric. We have models ranging is size from 250 - 600 Amps. Uses include maintenance, repair, fabrication, structural steel, construction, process piping, and as a stand-alone generator. 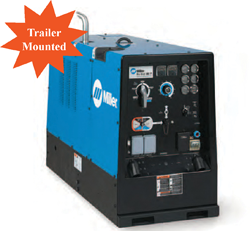 For a complete list of engine driven welders see Miller's industrial engine welders brochure. The Miller Bobcat 250 is a capable multi-process output welder and portable generator all in one. Designed primarily for stick welding, this welder can also serve as the power source for Flux Cored, MIG, DC TIG, Non-Critical AC TIG, Air Carbon Arc Cutting/Gouging, and Air Plasma Cutting/Gouging. We offer parts, and service, for customer machines. We also sell new and used welders. 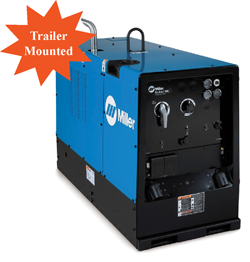 The Miller Big Blue 300 Pro welder was designed for professionals. They offer great ease of use, reliability, and fuel economy. Processes include: Stick, MIG, Flux-cored, DC TIG, Air Carbon Arc, and Air Plasma Cutting/Gouging. We offer parts, and service, for customer machines. We also sell new or used welders. Call us today for all your welding needs. Processes include: MIG, Flux Cored, Stick, TIG, Air Carbon Arc, Air Plasma Cutting. Pro 350 D CC/DC 20-350A 300 A, 32 VDC, 100% Duty Cycle 80 12 kVA/KW, 120/240 VAC, 100/50 A, 60 Hz H:30"
Processes include: Stick, MIG, Flux Cored, DC Tig, Submerged Arc, Stud Welding, Air Carbon Arc. Processes include: Stick, MIG, Flux Cored, DC TIG, Submerged Arc, Stud Welding, and Air Carbon Arc.